Former MLB pitcher; one of the greatest pitching coaches of all time. Five-time All-Star as a player; five-time World Series champ as a coach. His biggest impact was as a Yankee. He joined the team in 1964, but could not prevent a World Series loss that year, which began a long period of lousy seasons. During that time, Stottlemyre was exemplary. (He could bat, too. On September 26, 1964, he went five for five. 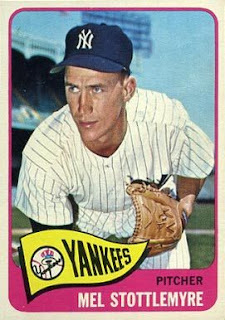 On July 20, 1965, Stottlemyre became the first pitcher to hit an inside-the-park hoer since 1910. His real impact was as a pitching coach. He rejoined the Yankees in 1996 and stayed through 2005, working wonders throughout the decade and helping restorethe Yankees' winning dynasty.Via the New York Times.